It’s that time of year again – electricity prices are increasing. On Tuesday (1st April), Eskom buyers will see a price increase of 8% whereas Municipalities will increase their prices on 1st July. You can delay or avoid that rise by being smarter about how much you buy, right now! For a household that normally spends R1,000 per month, you’ll now have to spend R1080 to get the same number amount of credits (912kWh if you’re on Homelight 60A). Following this post could easily save you R113. Just like filling up your petrol tank when you know petrol prices are going up, prepaid electricity can ‘fill up’ their meter with credits at the old price. But does this make sense? The short answer is YES… you’ll save 8% –> but you need to be really careful and you may not realise that you’ve really saved until a few months later. This is all because of inclining blocks. The strategy to save 8% is to buy up to the top in your ‘usual’ block before the price change, then after the price change buy the least in your usual current block. For Eskom Prepaid Homelight 60A households, this basically means – if you normally spend less than R575 each month, then this month you should buy R575 this month and then wait until you run out next month. If you normally spend much more than R575, then you should buy as much as you can – but then make sure you spend AT least R575 every month after that. Make sense? The inclining block tariff is like there’s a half-price special on cans of electricity every month, a special that’s limited to 600 cans per customer. If you buy 400 cans every month, you’ll always get them all at half price. If you buy 800 this month, then buy none next month — you don’t get them all at half price — the 400 extra that you buy this month, 200 will be at the normal half price, but the other 200 will be at the higher normal price, so you’ll end up paying more. BUT – if you buy 1200 cans every month, then you’re already buying 600 at half price and 600 at full price every month. Buying say 1800 this month and 600 next month before the price rise, would save you some money; but buying 2400 this month and 0 next month would be costly. That may be hard to follow, so we’ve decided to produce a little spreadsheet for anyone to put their numbers into. Just open the sheet, select your tariff and enter the amount you usually spend each month, and it will tell you what you should do. It only works for Eskom tariffs right now, as they are the ones going up in April; the rest don’t rise until July. As soon as we here what the new tariffs will be for Cape Town and Joburg we’ll update them – if you see them, please let us know by commenting below we’ll be happy to update! As you can see in the screenshot on the right – if you normally spend around R1000 per month you are buying 912 credits each month. This means you’re well above the cheaper credits and so any extras you buy will be at the higher rate. Currently you buy 600 credits at R0.89 each and 312 credits at R1.50 – making a total of R1,000 each month. Because you’re already in the top band you should buy as many credits as you can now, before the price rise; but then make sure you keep buying the ‘cheap’ credits each month. You could buy 3 months worth of ‘high cost’ credits – spending R2,406 this month. The next month, you have to keep on buying the cheaper credits, that means spending R574 every month and getting your 600 cheap-credits. If you do this, the extra credits you bought in March should last for 3 months, and will be R113 cheaper than if you bought them in April, May and June. We could go to the extremes here and buy 9 months of extra credits – spending around 5,200 this month and getting 2,800 more credits than usual. Provided you remember to type these into your meter (and your meter allows it!) and you keep buying at least 600 units every month all year-long (at a cost of R574 each month) you’ll save R338 compared with buying them throughout the year. Remember, you can buy extra credits, but you can’t just stop buying next month, you have to keep on buying R575; otherwise you’ll lose out on the cheap credits, effectively paying R1.50 for credits you could have bought for 96c! The situation is different if you’re already a frugal energy user. If you only spend R300 per month usually then you usually use 339 units each month. In this case you’re still in the low-cost block – meaning you’re only paying R0.89 per unit — for all your units! Next month you’ll be paying R0.96 for the same units; so you should still fill up; but only up to the point that you can buy units for the low price. You don’t want to end up paying R1.50 per unit, do you?! So, this month you should fill up up to the 600 units that you’re allowed to buy at the low price. This means you should spend R530 this month, R230 more than normal and get 261 extra credits. Then next month, rather than buy 339 credits like normal, you won’t need to buy as many. If you use the same amount as normal you’ll still need to buy R74 before the end of March; but that’s fine. Doing this should save you R18. Not a huge amount, but every little helps! Have a look at the spreadsheet – here – and send us any feedback. As always, we’re happy to help or answer any questions! Its my first time here and this is the first blog Ive read from you and I am totally impressed. I manage an office block that has a prepaid meter (2 Poort street Brackenfell, Western Cape). I want to purchase power within the blocks you mentioned so as to save on our sky high bill. How do I determine our block rate? Assuming the tariffs do increase next year (we don’t know for sure yet, I’ll ask the City again tomorrow) the best strategy is to literally fill up as much as you want… We can expect a price increase of 12.7% – so after 1st July 2015 you’ll be paying R2.40 for the same units –> but your meter won’t know that. 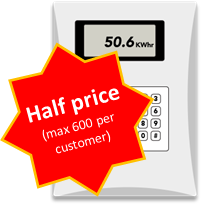 Once they’re bought and entered into your meter they are all the same — your meter doesn’t know the tariff went up, just the till where you buy them knows that! PPS – also, if you use a lot more than 1000kWh in a month, then actually you’d be better off on a different tariff (Small Power 1 say)… doing the opposite for someone right now on that! Awesome Rich. Thanks for the info. What is the rate on Small Power 1? Sorry for not replying sooner — I never got the alert that you replied! PS – let me know how you found us, and how much power you use and we’ll see what else we can help with!! Oh yes, I found you the ‘hard’ way…googled until I got an answer. Hi Riaan, just realised you were probably awaiting my reply. To determine your blocks the best bet is to check your receipts. It has to show you the rand amount paid and the units you bought. That way you can work backwards — e.g. if you paid R100 and got 46.94 units, then you know you paid R2.13 per unit – so you must be on Small Power 2. This spreadsheet is quite out of date now – it was built for last year’s price rises. This year’s (2015) price rises will be happening again in April for Eskom billed people and June for Municipalities. As such it may not be valid if they change the blocks. However, the price rises will be 12.69% — so there are more savings to get! If the blocks don’t change, then this will likely save you 12.7% in 2015. If you reply with how much you normally spend, and the tariff/municipality you buy prepaid credits from and I can work that out again for you if you want.